» Dublin Why Outrun The Bear? Just over a week to go to the Capital City Half Marathon. 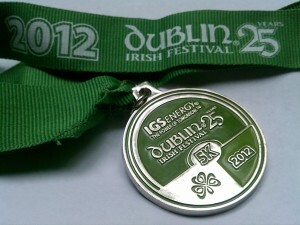 Looking forward to this race and I’ve already booked my next race – the Dublin Irish Festival 5k run in August. The cool thing about this race is it runs right past my house. It’ll be weird running down the hill past my house and not stopping and hitting the Garmin. The bad side to this race is that a lot of it is on a road that has no pavement (sidewalk) so it’s too dangerous to practise the route safely. I do run about 1/3 of the race nearly every time I go out though, including The Hill that I hate at the end of my usual runs, although I am finding it easier to run up it without stopping (but still have to sometimes!). In the meantime I have the half next weekend and I’m volunteering for a couple of other local races which should be fun.